Multiple locations in Massachusetts, Connecticut, New Jersey and New York. Bright Horizons is a leading provider of early education and preschools, employer-sponsored childcare, back-up care for children and adults/elders, and educational advisory services for college bound dependents. Bright Horizons provides complete consulting services to assess, identify, and respond to work/life challenges among organizations’ employees. And whenever Bright Horizons is challenged for additional space or in need of major improvements, they reach out to Costal Construction. We’ve been Bright Horizon’s go-to construction partner for X years now. 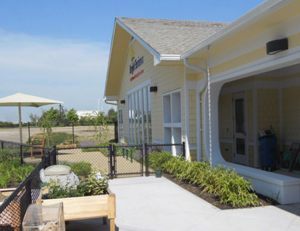 We’ve helped them fitout and remodel more than eight of their childcare centers, as well as took on all aspects of the expansion at their corporate headquarters. This 10,000 square foot facility in Hingham, MA was a LEED certified green construction project and was a wood framed structure with full span engineered roof trusses. The project also included site improvements and utilities as well as a multi-surfaced playground.